Marshall Ryan Maresca is the author of the novels, The Thorn of Dentonhill and A Murder of Mages, each of which begins its own fantasy series set in the port city of Maradaine. 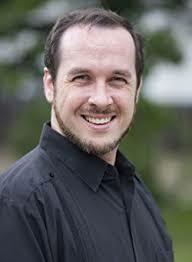 His work has appeared in the Norton Anthology of Hint Fiction and Rick Klaw’s anthology Rayguns Over Texas. He has had several short plays produced and has worked as a stage actor, a theatrical director, and an amateur chef. On September 16, Marshall, along with fellow author Amanda Downum, will teach “Worldbuilding for Speculative Fiction” at St. Edward’s University in Austin, TX. This class will introduce strategies for building a fictional world that readers don’t know, either because you invented it or because they’ve never been there. We asked Marshall about the books he’s learned from, challenges he’s faced in his own work, and what people will take away from the class. I don’t have to recommend it much, because it’s an enduring classic, but Watership Down is the book I constantly go back to. It stands out, not just for its gorgeous storytelling and impeccable craft, but for the rich world building that is woven throughout it. It’s the gold standard for creating a culture that is both utterly foreign yet immersive. The biggest thing I struggle with is the connective tissue, getting the characters from place A to place B in an organic way. For example, if I need two characters to independently reach the same place, I have to work out how each of them reach that conclusion, beyond the obvious Hand-Of-The-Author pushing them there. Every book has a moment, where everything just clicks — you know all the beats that remain to get you to the end. And at that point it’s mostly a matter of getting it out of your fingers. Usually that lasts until the end of the book. Not always, but usually. That I can’t teach you your process of writing— I can only show you my toolbox, and let that help you discover your process. That worldbuilding is not only a vital element of speculative fiction, but that the process of it can be an engaging activity, and the application of it in prose doesn’t need to be lifeless recitations of details. Click here to learn more about and register for Marshall’s class.